When you can trade 70,000 MileagePlus miles per person for a pair of United BusinessFirst tickets from Beijing to Newark, you feel as if you have won the lottery. The trip to and from China is quite long, any way you cut it—whether it’s made with layovers (if that’s your preference) or non-stop (if you have that option.) In fact, the distance between Beijing and the East coast is some 7100 air miles. Given the diminishing size and comfort of airline seats on all carriers, you don’t have to be a “seat guru” to realize that you want to make a long trip like this one as painless as possible. On our way to China, we were able to secure reasonably priced Cathay Pacific Premium Economy seats. But for the return segment of our trip, we felt as if we had won the lottery when we realized we could convert 140,000 MileagePlus miles for two seats on United BusinessFirst. We flew United Flight 88, a nonstop B777-200 from Beijing (PEK) to Newark International Airport (EWR). As BusinessFirst passengers, we were also afforded complimentary access to the sprawling China Airlines business lounge in Terminal 3 in Beijing, which was crowded but decent. Of course, seats are the main reason for choosing BusinessFirst tickets. Our plane had no first class seating; instead, United’s forward cabin is outfitted with twenty-six 180° lie-flat seats. We sat in Seats 3A and 3B, a window and aisle. Passengers receive amenity packs, full-size pillows, duvets and full-size headphones. The pod-like seats were spacious and comfortable with easy to maneuver controls. Their design helped to effectively buffer us from the rows of passengers in front and in back. The cabin had its own lavatory. While the lie-flat seats don’t offer sufficient space to turn over on your side, back sleepers will find the seats uber-comfortable. A trip goes much faster when you’ve been able to take a long snooze. Before takeoff, we were offered sparkling wine, then a choice of main course for our dinner to come with beer, cocktails or soft drinks. The options were Beijing-style beef, Zhangcha smoked duck, filet of cod, or stir-fried noodles. The five-course meal started off with a fish appetizer, followed by salad, the entrée, a cheese course and dessert. Halfway through the flight, we were offered beef noodle soup. 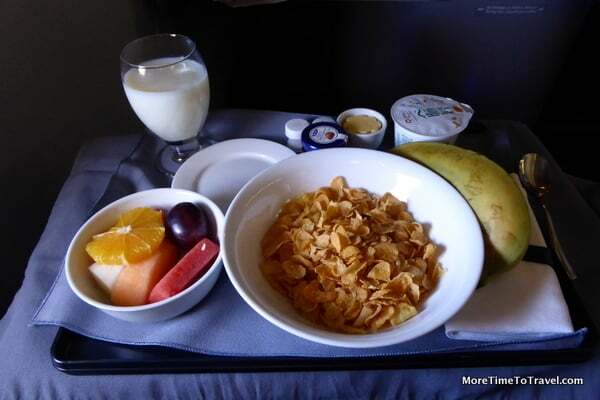 A full breakfast, either American or Chinese with coffee or tea, was served before landing. While plentiful, the food was only marginally better than most “airline food” but it was nice to eat on real china and drink out of glasses instead of plastic cups. An on-demand seatback entertainment system allowed us to choose from among more than more than 100 movies, many recent releases, and a variety of games, TV and audio programs. Our particular flight included a collection of movies curated by the Tribeca Film Festival. Given the slow death of many airline magazines, I was happy to find and read Hemispheres Magazine at my seat. Oversized seatback screens The flight attendants were hard working, gracious and attentive. Safety instructions were offered in both English and Chinese. In the end, the goals of any flight, long haul or not, are to get your destination as quickly, comfortably, conveniently, economically and safely as possible. We were delighted to have an on-time arrival at Newark. Other perks included priority check-in, baggage handling, boarding, and deplaning. Although the design of United’s lie-flat seats isn’t quite as comfortable or private as the ones we had experienced on British Airways, you can bet we’ll be saving our miles for upcoming trips on United’s BusinessFirst because it’s a great value. MileagePlus Saver Award seats seem to disappear from the website overnight. If you are able to find them, snag them as soon as possible. In comparison, the amount of miles required for standard award (vs. Saver Award) seats would have been 340,000 miles (vs. 140,000) for our two seats. If you can, avoid the center seats in the front row, which align with the lavatory. Seats along the aisle separating the B and C rows offer the best lavatory access. The cabin, like many others, can get quite chilly. Be sure to bring a sweater or light jacket. For more information, including routes, see the United Airlines website. What is it like to fly United p.s. Premium Service? Always love your tips. We are American frequent flyers, but it all feels the same. Sometimes we are too stingy with our miles, the extra comfort is worth it, especially on a long flight! Thank you for the reminder! Safe travels. A good look at an interesting service, Irene. The extra comfort is tempting, especially if you can get it for your rewards miles. But I always wonder if it’s really worth the outlay. Since I’m a side sleeper, these lie-flat seats wouldn’t help me at all. And it bothers my stomach to eat big meals on planes, so a lot of the value would be lost on me. As an aside, I flew to Beijing (direct) last year in an economy seat on Delta, and while the flights were long, the trip was surprisingly comfortable. They even had a little Chinese language lesson on the entertainment system! As someone over-50, I always worry about DVT—so I really appreciated the extra legroom. I worry about it, too — but the Delta flight had decent legroom, and I’m tall. I guess it depends on what plane you get, though overseas flights tend to get the biggest planes. On DVT, I don’t think there’s any substitute for getting up and stretching your legs periodically — makes you feel better all over. Hi Irene. yes, I find that paying for the basic travel and using points to upgrade is a great way to go. There’s nothing worse than flying 13 hours ant not being able to comfortably rest while in transit. Even if you don’t sleep, at least arriving rested gives you stamina to hit the ground running. It’s hard using the United points, too. If you pause to blink while you are searching for seats, you may very well lose them!